Boston is trying to make the city a little less foreboding during the dark, frigid months of winter. 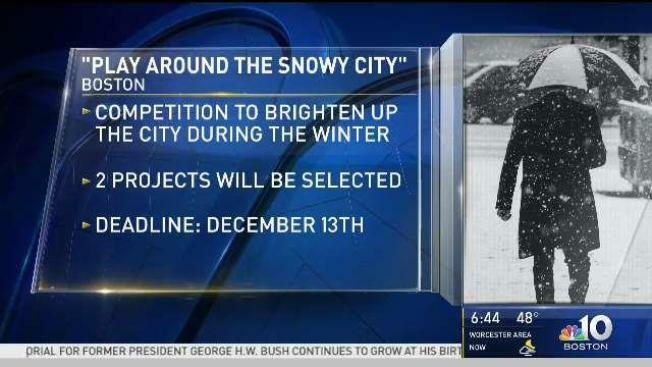 The city has begun accepting proposals for a competition dubbed "Play Around The Snowy City" which seeks ideas for projects designed to make Boston's public spaces more fun and inviting during the coldest season of the year. Organizers said applicants will be encouraged to submit projects that "reduce stress, build lifelong learning skills, and support responsive relationships." Two projects will be selected. Each project must be temporary, be in place by the first week of February and meet a budget of $5,000. While proposals may be located inside or outdoors, special consideration will be given to projects that creatively use winter elements. Proposals must be submitted by December 13 at 9 p.m.